shaded hedge banks and alongside paths. 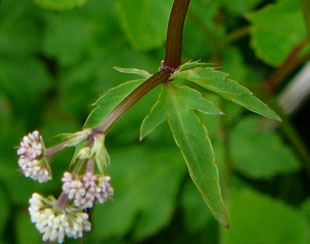 Sanicle is a native, perennial, umbellifer growing up to 60cm. 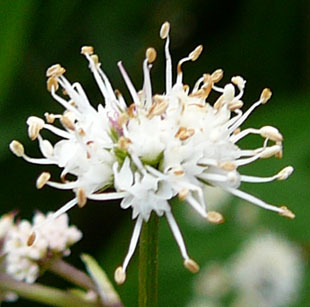 Flowers are in tight, round, flowerhead umbells, up to 1cm. Individual flowers are white with pink tinges and up to 3mm. the smaller umbells have thin, simple bracteoles. 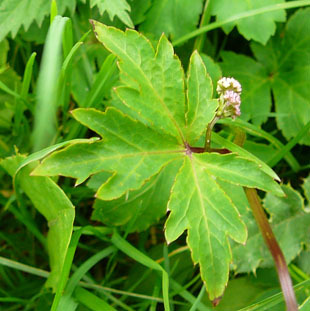 Leaves are stalked, palmately lobed and up to 6cm. 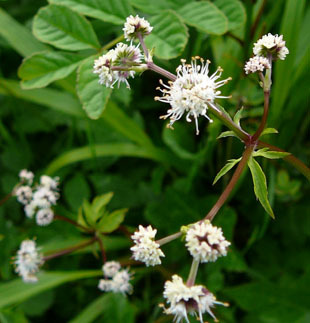 Stems are green and brown, and stiffly erect.